Open the container of pizza crust and roll it out onto a cutting board. Shape it into an even rectangle as best you can. Slice the pizza crust in half so you have two long strips. Spread the pizza sauce in a thin layer on one half of the pizza dough. Sprinkle the cheese evenly over the pizza sauce, and then sprinkle the pepperoni slices over that. Take the empty pizza dough half and place it over the pizza goodies. Slice it into 1" strips then pinch the ends of each strip closed. Transfer each strip to a cookie sheet lined with parchment paper. Twist each strip 2 or 3 times. Brush an even layer of olive oil over top of each pizza twist. Add the Parmesan cheese, garlic powder, dried oregano and dried basil to a small bowl and mix to combine. Sprinkle the mixture evenly over each of the pizza twists. Bake the pizza twists in the oven at 425F for 10 to 12 minutes or until golden brown. 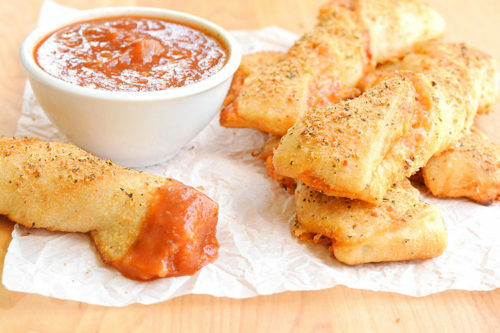 Serve the twisted pizza breadsticks with pizza sauce or your favourite marinara sauce for dipping.